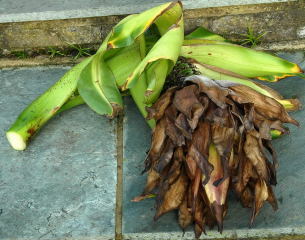 After seven years of being hauled in and out of the greenhouse this Abyssinian banana (Ensete ventricosum, Ethiopian banana) finally had enough. 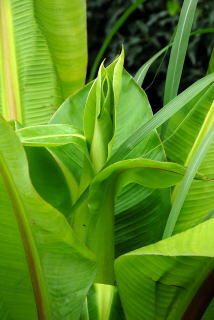 This particular plant is a seed-raised green Ensete ventricosum. Although this plant was entering its eighth growing season, it was not overly large. After about the third year, this plant and its siblings began to loose some of the enthusiasm they exhibited in their youth. On the other hand, other Ensete maurelii's in the garden have maintained their 'joie de vivre' regardless of age. The unusual behaviour began not long after being planted. Contrary to normal, instead of producing leaves of an ever increasing size, the plant appeared to have stalled with a couple of unimpressive leaves. 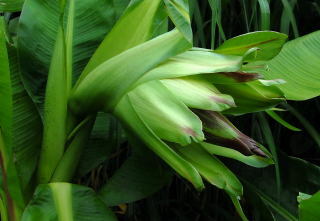 On closer inspection, the plant had begun to produce something resembling a corn on the cob. As the flower stalk grew it took on an arcked appearance. 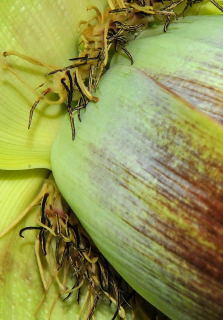 The bracts surrounding the 'bell' as it is know, opened up to reveal the flowers within. These flowers were particularly alluring for all flying insects of the brown and yellow striped variety, but in particular wasps. 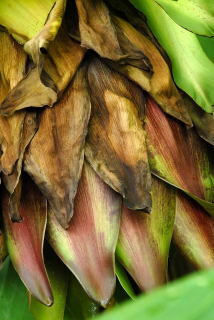 Although the bracts were initially held wide open, as the stem continued to grow, the older bracts withered and cloaked the subsequent flowers. Despite a constant stream of eager pollinators, only the initial few rows of flowers managed to produce fruit. 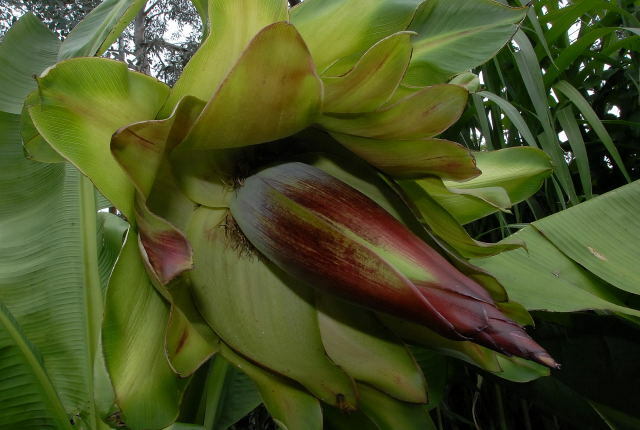 Although this particular summer there was a relatively long growing season, with the first frost not occurring until well into November, the bananas never grew particularly large. 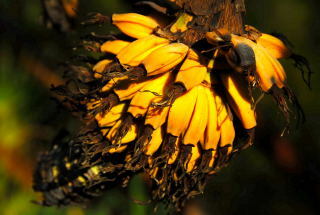 Once the first frost was forecast, the flower stem was removed with the bananas still green in order to see if they would ripen in the greenhouse. 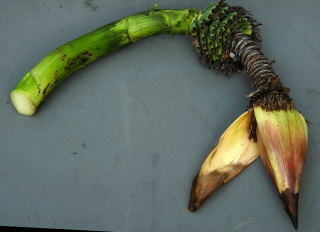 The old bracts were removed revealing the small bunch of small bananas and the bell. 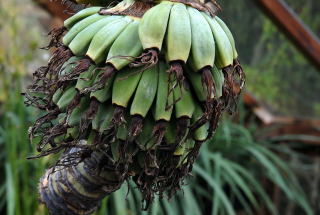 The bananas were hung up in the greenhouse and allowed to ripen. 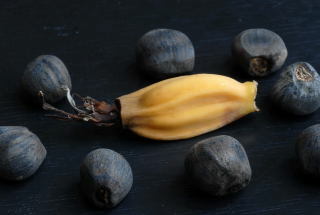 Here we see one of the larger ripe bananas surrounded (and no doubt feeling rather intimidated) by a group of mature Abyssinian banana seeds. Clearly any chance of passing on the family name from this banana to the next generation would be close to zero at best. 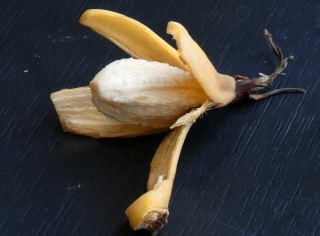 Peeling the fruit revealed an authentic but rather dry banana. Further dissection confirmed earlier suspicions of the seeds viability. The picture to the left shows the solid central core that had developed up the entire pseudostem. The picture on the right shows the cross section of a normal Ensete pseudostem. 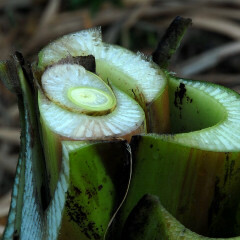 The picture below shows the solid core once it had been removed from the plant. 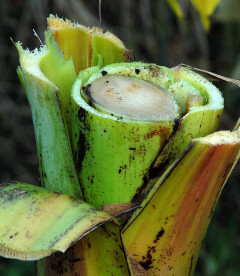 Some sources suggest that once the flower stalk has been cut off, the plant will begin to form suckers from the base. 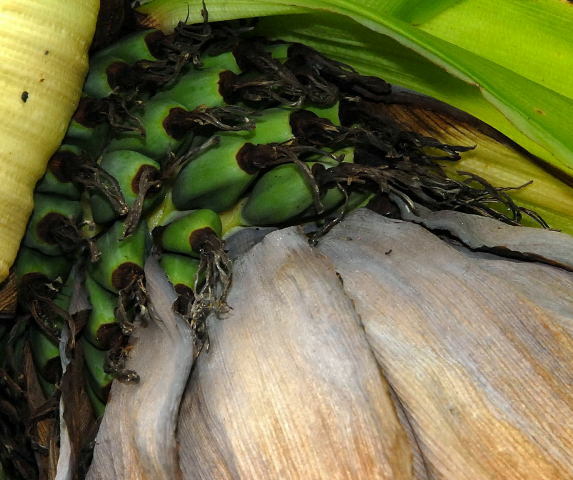 This information however only came to light after the entire Abyssinian banana had been chopped into a thousand pieces and added to the compost bin.